l'Italie Avec Les Iles qui en Dependent. 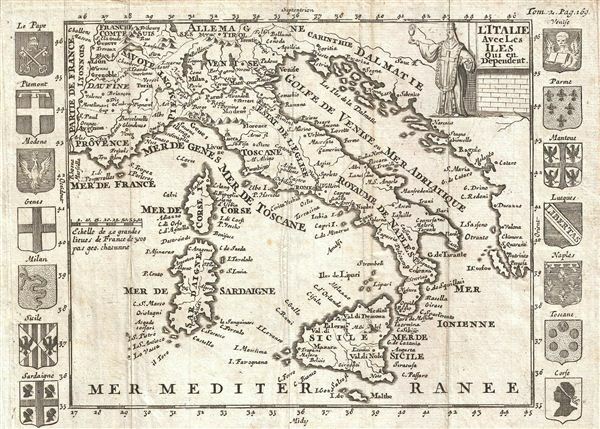 An uncommon map of Italy issued in 1700. Centered on peninsular Italy, this map covers from Provence to Corfu and from Tyrol to Malta, inclusive of Corsica, Sardinia, and Sicily. The map is surrounded by sixteen armorial crests representing various Italian regions. A decorative title cartouche possibly representative of the Pope appears in the Upper right quadrant. Prepared for Martineau du Plessis' Nouvelle Geographie, published in 1700.